With the last minute mad rush, Christmas is obviously a bad time for shopping, even groceries. I was at a supermarket yesterday, the hypermarket to be exact, when out of the blue, this 6 foot tall, frizzy-haired Amazon of a woman comes flying past me, trolley very obviously out of control, almost breaking the sound barrier and slicing off my toes in the process. After ricocheting off the fresh fruit and vegetables section, I tried to get my bearings. The heel had broken off my new Nike sandals, and my basket was now empty and lying upside-down at the other end of the aisle. I watched as a lonely tub of tofu disappeared under the aisle division. The blood rushed to my head. Grasping the weighing machine for support, I spotted her, submerged to the elbows in purple cauliflowers. She had a baby on her hip which was screaming its head off, its sticky fingers entangled in her over-dyed mop of blond hair. Now as any self respecting woman knows, there's a bad perm and there's a BAD PERM. This woman definitely sported the latter, with pride. I strode purposely towards her, breathing deeply. "Excuse me!" I said emphatically. She spun around. The baby promptly dropped its sucker into the mop. She didn't seem to notice. "Can you not see I'm busy?" she yelled at me, juggling onions at the same time as throwing random bunches of bananas into her trolley. She barely paused for breath before letting loose a storm of verbal abuse. Shocked, I backed off slightly. She continued to rant, frantically waving an oversized banana in my face. The sucker stick was now barely visible. I hadn't even said anything yet. This woman was clearly not well or I'd just interrupted a breakdown in progress. I backed off some more. The baby started to cry. A crowd was gathering in the aisle. "Security, please report to Aisle Three" came blaring out over the loudspeaker. I looked up. Aisle Two flashed menacingly above my head. Banana woman was getting closer. I started to panic and began my retreat. I backed into the Bakery section in my haste to get away. She was still coming. I heard the crowd murmur. I couldn't move. My fingers closed around a packet of doughnuts. I was just about to hurl it at her when the baby threw up. She was momentarily distracted. Taking the gap in a desperate "you can still save yourself" attempt, I heard a smash emanating from behind the tins of baked beans. Turning, I caught a quick glimpse of a very blonde head, before it vanished amongst the display. Oh God, not another one. "Mummy!" yelled the blond head as it catapulted into the trolley. The onlookers scattered. Mummy was frantically trying to wipe the vomit off her bright red Levis T-shirt when security rocked up. Trying to look inconspicuous, which wasn't easy with a shoe in one hand and a packet of jammy doughnuts in the other, I negotiated my escape. I smiled sweetly at the security guard, shrugged my shoulders and made "she's gone nuts" gestures with my hand as I passed. Turning briefly I saw the banana woman sitting in a crumpled heap on the floor, holding a packet of frozen peas to her head, a concerned store manager patting her shoulder. Isn't it amazing how a harmless act of grocery shopping can suddenly turn into a bizarre health hazard? Why does this happen, and what have we been reduced to as a race? Mall rage definitely exists. It’s a fact. It manifests in many shapes and forms, and has different causes and effects for everyone. Today’s lifestyle commands a much faster pace than 20 years ago. From dual-income families to singletons living the high-flying career life, most of us teeter dangerously on the edge from too many multivitamins and artificially high levels of gym-induced serotonin. In this “must try harder” society, harassed executives and junior yuppies will inevitably hit the aisles after work, or during their lunch hour. Well, mid day shopping is purely an exercise in frustration. From screaming around your office, running to and from engagements and meeting deadlines, it is virtually impossible to downshift to the pace required to follow a slow-moving family up an escalator, or bored housewives having a gossip session right in the entrance to the supermarket. So we’re in a bad mood before we even begin. Saturday mornings or any day in the first week of the month, especially after payday, should be avoided at all costs. The parking is impossible, hoards of over-excited kids on sugar highs race around annoying the general public, while disillusioned mothers try unsuccessfully to control them. And what’s with those tiny trolleys for kids anyway? Ditto with sale areas, and festival bargains. Fighting for the last “sale” under the harsh glare of the fluorescent lighting is enough to turn any normally sane person into a raving lunatic. Everyone knows fluorescent lighting increases stress levels, as does depleting stocks, narrow over-crowded aisles and ‘elevator’ music from the 1980s. Is that supposed to soothe us? So, karmically-speaking, we’re a real mess. Then there are the queues. Why is it that after standing for 20 shoe-tapping minutes the person in front of you hauls out their credit card to pay for two trolley loads of groceries? Of course it doesn’t work. Now the check-out assistants are check-out assistants for a reason, and they can’t possibly know why the credit card isn’t working. So we have to call visa or mastercard to get clearance (if its amex, its even worse). The clearance finally comes through after ten mind-numbing minutes, by which time you’ve polished off a tube of Rollo and half the queue has moved to aisle three. Only the die-hards are left, waiting out the storm. And it’s still not that simple. Now the store manager – who happens to be on a smoke break – has to be called to provide authorization for this recently cleared, over-extended credit card. He finally strolls up to the till, and authorizes. Thank God. By this stage, the collective beeping of 45 check-out machines has sent your mind into overdrive, and your blood sugar has leapt from dangerously low (pre-Mentos) to uncontrollably high (post Mentos) and unless you get out of this bloody shop in under five minutes you’re going to have to be institutionalized for life. So, we ask ourselves, what is the solution? Kid-free time slots would be a good first option. These coinciding with prime shopping time for those of us with jobs and no free time. Clear the aisles and let the efficient, the organized, the working people have free reign! Make sure you have a list. You know what you want. You go in, you get it and you leave. 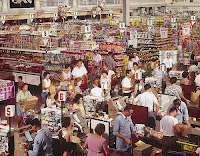 This minimizes the "vacant-shopper" syndrome and reduces chaos. Know your supermarket. You can weave expertly through the aisles, not having to double back because you’ve forgotten the tofu in aisle two. And the golden rule: never shop when you’re hungry! Hyperglycemia is a very common, often misunderstood condition. Low blood sugar contributes to mood swings, bursts of outrage, dizziness and in extreme conditions can induce coma. When coupled with a chaotic environment and hoards of people, the inevitable outcome is “mall rage”. Finally, if you know you’re a victim, you have a short temper, or you’re just a bad shopper, then get with the 21st century and shop online! What more could you want? As a friend of mine once said, “Oh, I don’t shop, darling. I have PEOPLE to do that for me…” With wishes for a happy and peaceful shopping! that was really funny in a very scary way...India is quite a friendly place and we see more people willing to help if you are in trouble. And Happy Shopping Next Time!!! Thnaks for the visit and a great New Year ahead and great shopping too!